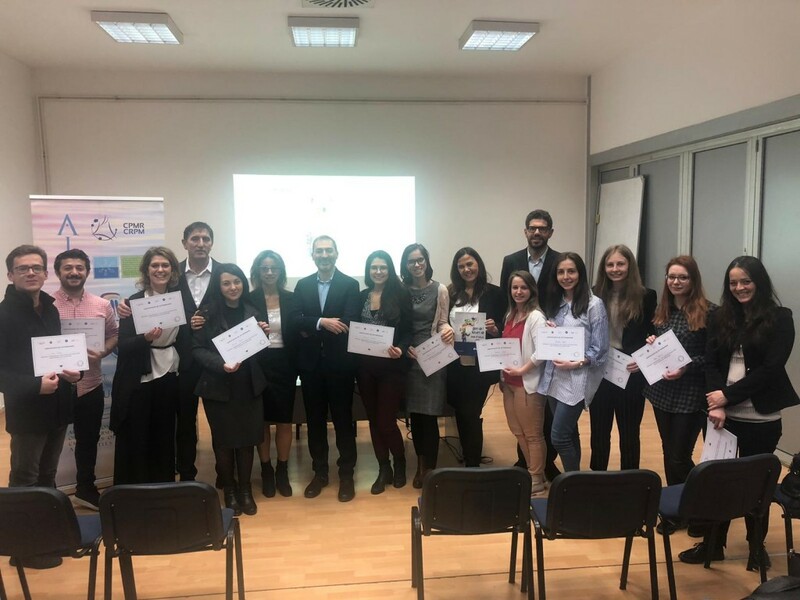 The Workshop “Doing Business in the Creative and Cultural Field – How to develop your business idea”, held in the framework of AI-NURECC Initiative, took place on 8th of March, hosted by University of Sarajevo – Center for Interdisciplinary Studies (BiH). The Adriatic-Ionian region has great potential to develop competitive and innovative creative and cultural industries that would benefit a wide range of stakeholders in the area. The purpose of the workshop was to encourage and support the creation of start-ups that link their activities to cultural heritage. The Training Workshop was split in different sessions: the day started with the greetings held by of relevant institutional actors, as Prof.dr. Aleksandra Nikolić, University of Sarajevo Vicerector; H.E. Nicola Minasi, Ambassador of Italy in Bosnia and Herzegovina; Phd. Marko Šantić, President of Chamber of Economy of the Federation of Bosnia and Herzegovina, member of Forum AIC; Stavros Kalognomos, Executive Secretary of the CPMR Balkan and Black Sea Commission, AI-NURECC Coordinator and Francesca Farinelli, General Manager Ecapital Culture. H.E. Nicola Minasi, Ambassador of Italy in Bosnia and Herzegovina, highlighted the important link between Universities and Institutions related to the business opportunities in the field of cultural heritage and tourism, a sector in expansion in Bosnia-Herzegovina. Moreover, the Ambassador mentioned that is necessary to create the start-up atmosphere by enhancing the following activities: develop government strategies for policies, programs and instruments that are key to entrepreneurship development, provide the level of formal education that from the earliest days will encourage young people to develop the spirit of entrepreneurship and create competencies that are crucial to further development. Then the training-session, introduced and moderated by Dr Giuseppe De Maso, Marche Polytechnic University, was held by professors and experts on territorial development which showcased methodologies and territorial, as well as financial opportunities. In particular, Prof. Jovo Ateljević, Faculty of Economics, University of Banja Luka, spoke about Tourism Industry in Bosnia-Herzegovina. After explaining which are the characteristics of a successful entrepreneur, the Professor exposed how tourism entrepreneurship can answer to the new circumstances. Then, Prof. Almir Pestek, University of Sarajevo intervened speaking about “Strategic management and marketing in the creative and cultural industries”. During the second session participants were split in working groups. Participants had the opportunity to start developing a concrete business idea. During this session, the Adriatic Start–up School, 2019 Edition, was presented by the General Manager of Ecapital Culture. The project, that will take place in Ancona during the summer, intends to encourage creation and development of innovative cultural companies aimed at enhancing the cultural heritage of the Adriatic-Ionian Macroregion. The Adriatic Start-up School final purpose is to draw up business plans to be submitted to the institutional, entrepreneurial and financial world of EUSAIR. One of the successful cases, developed during the first edition of the Adriatic Start-up School, “Life on a boat”, was then presented by its CEO, Genta Ahmeti. At the end of the workshop, all participants received a certificate of attendance and a start-up package with materials useful to further develop entrepreneurial skills as self-study. On Saturday 9 March 2019, the Italian Embassy in Sarajevo organized the first University Fair which took place at the Faculty of Philosophy of the University of Sarajevo.The event aim was to allow students of high schools and universities in Bosnia and Herzegovina interested in following a course of study in Italy to learn about the courses in degree offered by some of the most prestigious Italian universities. The Fair responds to the growing number of students interested in study opportunities in Italy. To this end, as part of AI-NURECC iniative, the Adriatic Start-up School newcoming edition was presented.